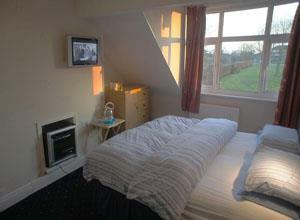 Abinger Guest House Guest HouseGuest house rates, hotel quality. We are proud of our rating and treat all guests like hotel inspectors! We're highly rated on TripAdvisor - take a look at our entry. All eight guest rooms are fully equipped with wash basins (shared facilities are throughout the property), flat screen TVs with freeview, refrigerators, complimentary beverages and hairdryers. Our mattresses are all new and of very high quality, and room furnishings are stylish and contemporary. We are frequently complimented on the quality of our full English breakfasts - included in the room rate. Our orange juice and mushrooms are fresh, our eggs are free range and all other produce is the best we can buy. Unrestricted street parking is available outside Abinger Guest House. Abinger Guest House sometimes limits bookings to 2 or more days. Double / Twin sometimes limits bookings to 2 or more days. 3 single beds, TV with freeview, mini bar fridge and hairdryer. Triple / Family sometimes limits bookings to 2 or more days. TV with freeview, mini bar, fridge and hairdryer. The guesthouse is located 100 metres west of the junction of Fosse Road South and Hinckley Road. Approx 750 metres from Leicester city centre. Because the owner was more than willing to help make our stay comfortable. Nothing was too much trouble. He also had a wealth of information. Thank you Nichole. I'm delighted you enjoyed your visit enough to post a review.